Animal Health and Welfare NI (AHWNI) was formally launched in 2012. It is an industry-led, not-for-profit partnership between livestock producers, processors, animal health advisers and government. It is overseen by a board of directors. Its remit covers diseases and conditions of cattle which are endemic in Northern Ireland, but which are not currently subject to regulation or coordinated programmes of control. AHWNI seeks to benefit livestock producers and processors by providing the knowledge, education and coordination required to establish effective control programmes for non-notifiable diseases of livestock. 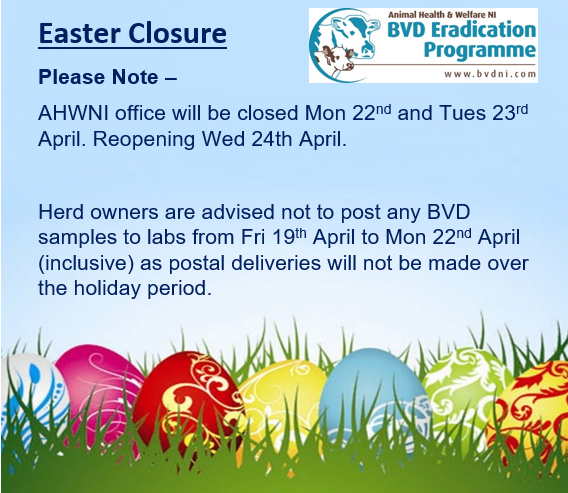 The first of these programmes will address bovine viral diarrhoea virus (BVDV). A programme on Johne’s disease is also under development.